Today we have a new guest poster, Mary Jo Foley — who some of you may recognize from her articles in eWeek and her new blog on ZDNET. But instead of striking fear in the heart of Microsoft, Mary Jo has her sights set on that OTHER mega-corporation in the Pacific Northwest. Sheilds up, Starbucks. Ever since I moved back East from Seattle — and quit my three-latte-a-day habit in the process — I’ve pined greatly for my former steamed-milk beverage of choice. Sure, there were chai tea lattes available at every coffee chain and hole-in-the-wall café in New York. And there were milk teas (with or without bubbles) galore being poured by tea shops in and around Chinatown. But these drinks were usually too sweet bland for me. So last spring, when I saw a new drink special — a green tea latte — pop up on the Starbucks menu, I wondered if I had found the answer to my foam-fetish prayers. I still remember my first: It was St. Patrick’s Day party-hat green. The melon syrup was cloying, but added a certain mystery. The mixture of Green-tea matcha powder and my selected soy milk was odd…yet intriguing. In short, I was hooked. And so, it seems, were plenty of others. Ever since Starbucks officially introduced the Starbucks Green Tea Latte on April 4, 2006, it’s been a topic of discussion on food blogs. It seems to be one of those products you either love or hate. And one which a number of other coffee/tea shops have rushed to one-up. Starbucks won’t share numbers on how many green tea lattes it has sold in the past year. 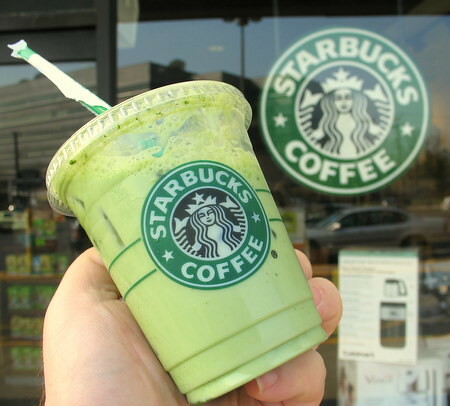 Because of its popularity, “we have made the Green Tea Latte part of our regular menu,” Passe told me, via e-mail. Seattle’s Best Coffee, which Starbucks acquired in July 2003, also has added to its menu its own version of the green-tea latte. Again, Starbucks isn’t sharing numbers on sales there. “Tea lattes and tea as a whole is a growing business for Starbucks and we feel it addresses a different need-state vs. espresso-based beverages, as it skews more towards the afternoon and it’s a non-coffee alternative,” Passe said. Not every New York coffee shop is jumping on the tea-latte bandwagon. At the East 13th Street branch of Joe, my recent request for a green tea latte was met with a puzzled look from the barista on duty. “We could just make you some green tea and you could pour some steamed milk in it, then doctor it up with honey and some spices,” the I-want-to-be-helpful one suggested, to my obvious horror. It’s a slow battle, but we’ll convert the coffee aficionados, I predict, one matcha-based tea at a time. This entry was posted on Wednesday, April 4th, 2007 at 12:11 am and is filed under Blogroll, Food, General, Media, New York City. You can follow any responses to this entry through the RSS 2.0 feed. You can leave a response, or trackback from your own site. I have one response to this posting about green tea and starbucks since I live in the Seattle/Bellevue area: http://www.kootsgreentea.com! I’m really shocked that Mary Jo hasn’t visited either of the 2 locations of the greatest threat to Starbucks. I would love to read what Mary Jo has to say about Koots Green Tea. Hi, Linda. Next time I’m out in Seattle, I’ll definitely give them a try. (These days, I cover Microsoft — and Starbucks — from NYC). Now I make my own cup from the green tea powder from teacuppa.com! I came across the green tea latte at the Starbucks in the airport in Atlanta. I am usually a no-caffeine person and wanted to grab somthing nice and hot before boarding the plane to Europe. For some reason I decided to try the green tea latte. When I saw the colour of it I thought, hmmm a bit odd. Then I tasted it and immediately fell in love! I’m going to check out Starbucks Paris to see if they offer it! It seems people either love it or hate it. ha this is my favorite drink to get there! with the soy and everything, its truly amazing. and im getting really excited about tea. Starbucks Green Tea Lattes are sensational, terrific, best thing on the menu. I prefer the hot, too much ice in the cold version. Love this. Just always wonder after I polish one off, “How fattening is this?” Anyone know? This is my all time favorite drink and I am the ultimate Starbucks junkie. This may not be for all of you, but I will recommend getting the iced green tea latte, light ice, unsweetened, with whole milk. If you have ever sampled the green tea latte unsweetned with a lower fat milk you might comment that it tastes like grass. I agree. If you use 2% or even better, whole milk, the fat from the milk adds a subtle creamy sweetness to the drink and you can avoid the simple suger calories. Delicious. If you are on good terms with the Barista, you can ask she or he to make the iced green tea latte similar to how they make the hot version, which is adding the powder to a small amount of liquid and steaming it for a few moments. This changes the taste of the green tea in a positive way and when it is iced, it retains the more robust flavor. Add sugar free vanilla syrup and it tastes like green tea ice cream.